A Local Access Forum in Sutherland is bringing together all parties with an interest in developing and managing access to the outdoors. It is an independent advisory body working to promote dialogue and understanding, developing a consensus and promoting a co-operative approach to access to the countryside and inland waters. getting to grips with their new role. The forum will particularly provide guidance to assist the Council in resolving access issues and problems such as locked gates, dogs and livestock etc. take other form of access with confidence." Matt Dent, the Access Officer for Sutherland said "The Highlands of Scotland have a long history of outdoor recreation and the Land Reform Act builds on this tradition of welcoming visitors. A code of conduct (the Scottish Outdoor Access Code) has been produced along side the act to guide the public and land owners about responsible access and management. "With so many activities covered by the legislation there is likely to be something in the code new to most people. Be it cyclists giving way ,to walkers on narrow paths or canoeing carefully past anglers, the range of pursuits undertaken in the countryside means responsible access is vital. And of course the older problems, such as dog fouling, should not be forgotten." 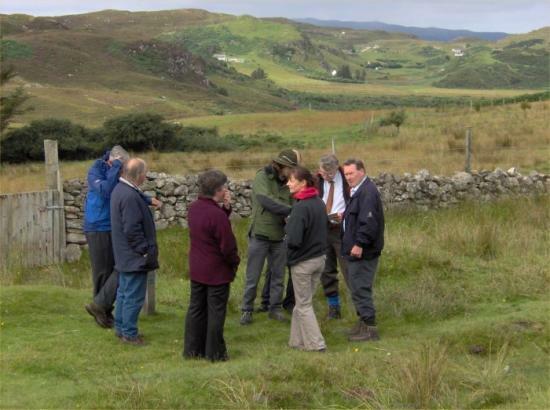 Photo shows some members of the Sutherland Local Access Forum on a site visit to Skerray.